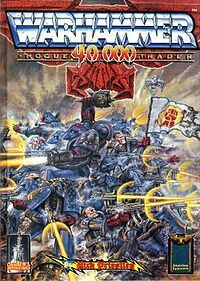 When Warhammer 40,000: Rogue Trader (by Rick Priestley) was released in the Fall of 1987, I took no notice of it. Partly, this was because I was never much of a wargamer, miniatures or otherwise and partly it was because, at the time, Warhammer in any of its forms just wasn't on my radar. There's also the fact that I was just starting college that Fall and had begun to pay increasingly less attention to the hobby outside of my waning interest in both AD&D and Traveller. So, this important 288-page book appeared and it'd be several years before I'd even realized it. I call it an "important" book because I think Rogue Trader, as the inaugural volume of the larger Warhammer 40,000 game line, kicked off something that's had a lasting impact on the hobby. For one, Warhammer 40,000 is, like Dungeons & Dragons and Vampire, one of those properties that has some currency outside of the geek echo chamber. Not only are their 40K video games, but a great many malls across North America have Games Workshop stores filled with painted miniatures and terrain on display. On most weekends, there are demos being run and I've seen with my own two eyes how attractive the game is to kids of a certain age, who flock to the store to watch it being played. In some respects, it reminds me of how I used to view the hobby when I was younger, when going to a hobby shop meant, among other things, watching the older guys play and wishing that I could be part of their adventures. But, as I said, I didn't notice Rogue Trader in 1987; it'd be quite a few years before I started to do so, by which point it had already become a genuine "phenomenon." It'd be several more years still before I had the chance to look at a copy of the book that started it all and, I have to admit, I can completely understand why it became so popular. Though, at base, it's little more than a skirmish-level science fantasy miniatures game, a great deal of attention was devoted to its far future setting. Indeed, more than half of the book is devoted to detailing what it calls "The Age of the Imperium," when humanity, under the rule of its God Emperor, contends with a variety of alien races for control of the galaxy. These alien races draw from both fantasy and science fiction ideas, which I think is part of their appeal. They are familiar enough to be convenient points of entry into a strange and dark vision of the future. Even today, darkness -- or "grim darkness," I suppose -- is what 40K is known for and I think there's a good reason for that. Rogue Trader posits a future in which "there is only war" and even the ostensible "good guys" of the setting, the Imperium, are nasty and brutal. In many ways, it's a nigh-perfect example of what we, on this side of the Atlantic, saw as "British Fantasy." At the same time, Rogue Trader doesn't revel in its darkness. Rather, it presents it matter of factly, in a kind of resigned "that's just the way it is" fashion that is strangely compelling. Furthermore, it's also written with humor (albeit of a black sort at times) so that its darkness, while present, isn't oppressive. In fact, there are even glimmers of hope here and there, peeking through the gloom. Among those glimmers are the eponymous rogue traders -- "vociferous Space Marine leaders, influential Navigators, liberal-minded Inquisitors and rebellion Imperial Commanders" -- who've been tasked by the Imperium to explore the unknown reaches of the galaxy in a quest for knowledge, resources, and materiel for use in the Imperium's wars. The game assumes that its battle scenarios take places against this backdrop. It's very clever, I think, since it provides a good excuse to keep battles small and ever-changing, as the rogue traders, with their limited resources, go from world to world on their quest. What's fascinating about Rogue Trader is how much like a roleplaying game it seems. Unlike many wargames, there's an explicit referee (or gamesmaster), who adjudicates the rules in play. Likewise, because the scale is so small, the book can concentrate on little details, such as the various types of armor, weapons, psychic powers, etc. that might be less useful in games involving more miniatures per side. Likewise, the game includes rules for "personalities," named units representing heroes and commanders with unique abilities that can improve over time. Considering that roleplaying grew out of miniatures wargaming, it's no surprise that latter day miniatures wargames might borrow elements from RPGs. Even so, it's hard for me not to look at Rogue Trader and wonder why it wasn't released as a roleplaying game -- except perhaps that, even in 1987, there was probably more money to be made in miniatures wargaming. Given how expensive it is to get into Warhammer 40,000, I can't say I'm sorry I never paid much attention to its original appearance, but I nevertheless can't deny that I've always found the setting of the game pretty intriguing, especially once I got the chance to see it in its ur-form, before it had decades of development and changes. It's definitely one of the great creations of the wider hobby. I think Rogue Trader was intended as a role-playing game at first; I remember seeing early adverts for it stating as much, but I suspect that the success of Warhammer may have led to some changes behind the scenes. That said, it's probably possible to play it as a role-playing game if one really wanted to, albeit a combat-heavy one. Two decades later, we did get our Rogue Trader rpg and it's not a bad game, but of course by then the setting had changed to be a great deal less wild and chaotic -- pun sort of intended -- so it feels like a very different game to the one advertised back in the early 80's. I think you hit the nail right on the head with laying 40k's success on its gritty darkness. Even in todays sanitized version there is plenty bleakness and horror (just check out forgeworlds excellent Badab war books). Ok so lots of it has to be pre teen friendly now but those of us who remember the old days still hold the darkness to our hearts. It was indeed advertised as a rpg before it was published. And I played it as one at the time. As it was mostly compatible with Warhammer RPG and Warhammer 3rd ed, there had been some published rules in a fanzine to play it Warhammer rpg 1st Ed way. Before the 87' version of Rogue Trader, there was another wargame set in the 40K universe. Can't think of the title, but I remember the books were as small as the LBB's. There is an excellent and sometimes hilarious interview with Rick Priestley by the "Tales From The Maelstrom" blog which clears up some of the confusion. In terms of having a distinctive and readily apparent 'feel', I feel like GW in the mid-80's had one of the best creative teams in the business. There were lots of settings and 'worldbuilding' going on during that period, but most of them I read without really feeling that I had a very solid grasp of the 'flavor' of the world. If you read a GW book from that era, you really felt like you knew what they were going for, and it felt very distinctive from some of the other quasi-generic fantasy settings (though the Warhammer world had its own share of Tolkeinisms and the like). What was more impressive is how creative and detailed a world the team built using just the gaming rulebooks- novels and stories played a much smaller role compared with, say, TSR of the same era. Books like the original WFRP book or Realm of Chaos: The Lost and the Damned had great, distinctive art, little vignettes that conveyed tons of atmosphere, and lots of little rules details that helped the game and the setting feel very unified. I bought my copy of Rogue Trader at the same comic shop I'd been buying 2000 AD comics and collections. Because I already loved Judge Dredd, Nemesis, Rogue Trooper and ABC Warriors I immediately got what the game was aiming for. It was a long while before I actually played a proper minis game with those rules but I started incorporating elements of the setting into my Gamma World games right away... becoming that setting's distant future which the PCs visited (usually unwillingly) on occasion. I had a long response and then my computer just crapped out on me for a Windows update. I hate that. Here's a brief recap. Yes, Rogue Trader is one of my favorite games that I never play. I wish it would've been and RPG. The Fantasu Flight 40K RPGs are nice, but to crunchy for me. I wanted something more like Warhammer Fantasy Roleplay 1st edition. Dragon #149 has an article titled "Orcs In Spcae!" by Ken Rolston discussing the topic. It provides some basic rules for extending hit points of personality characters. There's a critical hit chart and a survival chart to determine if the charcter was knocked out, injured or dead. Also Games Workshop produced Citi-Blok for use with both Judge Dredd and Rogur Trader. it was a collection of card-stock floorplans and props much like their Halls of Horror set. It also included rules for playing smaller 40K squads inside buildings, making it even closer to a skirmish game or RPG. That's a great blog too. The guys still use RT quite heavily in their games, and they have a lot of reports there that give a sense of how much like a tactical RPG the game can be if played that way. There are some full write-ups deeper down in the history. There was also a joint interview with John Stallard doing the rounds a year or two back too, more focused on the development of GW as a whole, but with discussion of 40K, WFB and D&D. It was hosted by Battlegames it seems - and maybe still is somewhere. Maybe someone with better fu than me can dig up a link. Quite a few wargames use referees - even modern ones. Too Fat Lardies make some excellent games which officially require one, but they're designed so players can come to an agreement anyway. For instance, shooting in their WW2 game depends on whether the firers have a poor, good or great shot at the target, based on cover, positioning and all that. A neutral referee is supposed to decide it, but it works fine if most of the time you have a good enough shot, unless it's obvious to both players that you're firing at infantry on a flat stretch of road without cover, or hull-down tanks. Of course, it also doesn't have a points system, and assumes you'll set up a scenario or just say "Oi, Steve, fancy a game next week? I'll bring a company of Brits, a few tanks." If you're attacking a fortified defender, bring better or more troops, and so on. It still gives the best result when you have someone set up a scenario, though. Lay out the board, let the defenders start hidden and use the spotting rules, have the referee control reinforcements and events, occasionally take a player aside to say "That wood you just tried to move into is far thicker than it looked, it's effectively impassable." So yeah, referees still exist in wargaming. Hooray. I'm pretty sure those are the original rules, or identical reprints. 15mm.co.uk is completely legitimate, and their service is excellent. I'd go with their (delightfully simple) USE ME rules or something else over Laserburn if you want to actually play, though. It's the mix of gritty darkness, black humour and blatant silliness that makes it work. I mean, one of the example characters is Inquisitor Obiwan Sherlock Clousseau. It wasn't set in the 40K universe, assuming you're thinking of Laserburn, but it had a lot of elements that made it into 40K. One or two things that didn't make it in at first showed up in Necromunda (the 2e 40K-based gang-skirmish game) as well, like the Redemptionists. The original Rogue Trader game was truly revolutionary, based on the foundation laid by Bryan Ansell's Laserburn. The rules are exemplary for futuristic roleplay campaings. For example, author Rick Priestley writes in Compendium (1989, p. 89) about "development of psi-powers in campaigns" and mentions using additional rules for "our WH40K improvised roleplay games". Same type of gameplay was presented in the Realm of Chaos volumes. A good example of such being the Star Child Sensei Adventurer Bands (The Lost and the Damned, p. 184), which resemble to some degree the heroes of the Star Wars movies. and so on, not to forget Zombies, Vampires and others. Some details remind of japanese science fiction, such as Galaxy Express 999. An another example would be psycannon (Slaves to Darkness, p. 250) which reminds Cobra's psycho-gun in Space Cobra television series. I will never forget the feeling of "whoah" that this book gave me as a teenager, somewhat akin to an awakening perhaps. Either way, I loved it and lament the blandness that followed. On the other hand, I have been quite enjoying the Horus Heresy novels, which feel somehow "right". I was also surprised how much of the Foundation novels were in the Rogue Trader universe. I never got into the WH40K games, save for Necromunda, and even still, I would have preferred it as an RPG. I then found out that it started out on WD magazine, as a semi-RPG/wargame game called Confrontation. I like the mix of genre and techno-goth style of the wargame, but I also like the open-ended nature of Confrontation. I have read the old Rogue Trader book, and I also like it. The later stuff made the setting feel too serious, so it is nice to know that it's roots are not as serious-minded - much like the Judge Dredd comics. Those games were tagged "3D Role Play", weren't they? I like almost all of what they did in the current Rogue Trader RPG, but it's just so *fiddly. * Piles of modifiers to everything, it seems like. But there's tons of neat ideas, and there aren't a lot of RPGs where you can start out with a kilometers-long starship capable of planetary bombardment. They didn't release a 40k RPG back in the 80s, but they started a whole line of them just a few years ago, with different books covering different power levels (anything between Imperial Guard and Space Marine). Might be worth checking out. I've never given it much thought either... other than the fact that the 2 gaming stores near me are both pretty much 75% Warhammer stuff... 25% everything else. It kinda seems like many of the current crop of video game designers who make sci-fi FPS-type games (Halo, Gears of War, Unreal Tournament, and the like...) owe much to the Warhammer look and ethos, however. They were indeed. A nebulous term! That's exactly my impression of the latter game too. Great idea, spoiled a little by the mechanics. Exactly. I think the big creative mistake GW have made over the past couple of decades -- and it's not been a financial mistake, it's clear to see -- is removing the humour from their settings. On the other hand, publishing the Ciaphas Cain books has been neither a creative nor a financial mistake for them! If you haven't encountered them, you should check them out - they're basically The Reluctant Adventures of Commissar Blackadder Flashman, Hero of the Imperium. Some of the recent Codices and rulebooks have been very lacking in humour though, and most of the novel lines are fairly serious. 40k, as you might expect, has gone through its share of changes -- paralleling many of the changes in D&D. Rogue Trader, w/ its unapologetic borrowing from Dune, Star Wars, and D&D, has that rough, energetic, "hobbyist" feel (it includes a section on how to make your own terrain from a dessert tub!). Nothing is "official" or locked down in any way in RT -- not unit stats, unit organization, equipment lists, or even the way that the now-iconic space marines are depicted in the game's quite varied artwork. In my opinion though, the very best part of RT is an easily-overlooked little chart on page 58: "The Point System" opens things up so that the player can use any model or combination of models and stat them out for the RT system. This reminds me very much of the way that Gygax used dime store dinosaurs and monsters to develop new creatures to challenge his wargaming buddies. What a difference from the carefully marketed official "codex" releases of today's 40k.